This property at 69 Maple Ave was first numbered #33 Maple St. The entire street was renumbered about 1927 to the current numeration. Oct. 23, 1874 Andover Advertiser - AA – John H. Flint is at work on a new avenue leading through his land from Elm Street to Carmel lane. John H. Flint was a local businessman, married Frances Tyer, and lived at 8 Elm St. Flint owned most of the land near his home and created Maple Ave in 1874. The property once was part of the Locke estate at 70 Elm St.
Flint sold this property on the east side of Maple Ave to Henry A. Bodwell on Mar. 31, 1883. The 1882 Birdseye map of Andover Center clearly shows the Bodwell home (#37) on the new avenue. A parcel map created for Bodwell in Dec. 1890 (map #709) shows eleven lots laid out on this side of Maple Ave. It appears that Henry may have purchased all of them. Henry died on May 17, 1891 and his estate was inherited by his widow Emma A, and his children. This lot at 69 Maple Ave was sold to Catherine Clark, wife of Justin S. Clark on April 29, 1897. The deed has certain requirements as to setback from the street if building a dwelling house upon the parcel. It was a common practice to place the property in the wife's name to protect the asset in the event of death or estate creditors after a business failure. John Justin Edwards Clark lived in the stone house at 29 Cuba St. Justin was born Oct. 1, 1857 in Andover, son of Aaron Sawyer & Sarah M. (Yeaton) Clark, Justin was one of 8 surviving children of Aaron and Sarah and siblings of their previous marriages. 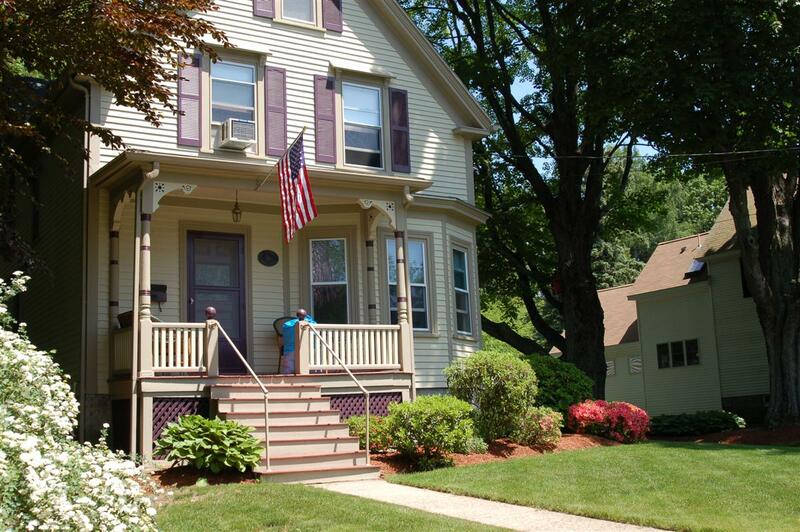 Justin grew up at 19 Cuba St., attended Andover Public Schools and Punchard Free School. He went to the School of Telegraphy in Boston becoming the telegraph operator with the Boston & Maine RR at the Lowell Junction office in 1878. Three years later he was transferred to So. Lawrence office where he served 32 years before retiring on July 4, 1913. Justin married on Aug. 4, 1881 to Catherine Sweet Spence born in Ontario to Scottish parents . They had four children; Bertha Newcomb (later Trott) b. Dec. 12, 1882, Jennie Elizabeth (later Fraser) b. Aug.12, 1884, James Edward b. Oct. 27, 1885 and Edith Estella (later Burnham) b. June 5, 1887. The two youngest were born in the stone house at 29 Cuba St.
Justin also was a real estate developer. He owned several properties in Abbott Village and hired carpenter Sewell to build the two family tenement house at #38 - #42 Red Spring Rd. In 1896 the Clarks sold the stone house at 29 Cuba to Catherine Connolly and moved to 33 Maple Ave when the home was completed. 1891 directory, Clark on Cuba St. - 1897-8 #33 Maple St. - 1908 directory Justin E. Clark, telegraph operator, #33 maple Ave. The Clarks sold the home to Robert Clements, wife Edith on July 21, 1919. Robert Samuel Clements was b. Apr. 6, 1885 in North Andover son of William J. & Eliza F. (Redding) Clements. Robert married on Sept. 1, 1909 to Edith Helen Somerville b. Apr. 22, 1886 North Andover, dau. of William H. & Eliza A. (Haywood) Somerville. Robert was a chauffeur for Frederick H. Jones of 71 Central St, owner of the Merrimack Card Clothing Co. Robert & Edith had two sons, Phillip S. b 1913 and Robert C. b. Mar. 19, 1916. Both went to Phillips Academy. Sadly son Robert died in 1930 at age 15 and is interred at Ridgewood Cemetery, North Andover. A Boy Scout memorial plaque and flag marks his grave. On Sept. 13, 1930 Robert & Edith sell their home to Robert G. Jacques and moved to 6 Torr St. Andover. Robert G. Jacques was b. Aug. 2, 1880 in Andover, oldest child of William and Sarah Jacques who lived on River Street in Ballardvale. William and Sarah had seven children: Robert b. 1880, Harriet E. b. 1882, Benjamin b. 1884, Linda A. b. 1887, William Jr. b. 1889, Henrietta b. 1891 and Margaret b. 1897. In 1910 and 1920 all were living on River St. Their mother Sarah died on July 18, 1928. All must have been heirs to their parents estate. Only two married, Benjamin to Alice, was proprietor of a coal and wood yard on Andover St, and William who married Myrtie, was a gardener and caretaker of the Barnard estate at 8 High St. on Elm Sq. Robert G. first worked as a carder in the Ballardvale Mills and later for his brother William then was employed by Phillips Academy. As the oldest, when he purchased Maple Ave home, has siblings lived with him. Harriet was a weaver in the mills and then worked at the Andover Steam Laundry on Post Office Ave. Margaret also worked for the laundry. Linda and Henrietta became RN nurses. Henrietta worked as a private nurse for the Jacob W. Barnard family. In 1940 only Robert, Henrietta and Margaret resided at 69 Maple St. As each sibling passed, the deed was passed down. The Jacques owned for 59 years. The property then was sold to Mark C. & Joanne Lightbown on Aug. 28, 1989. Lighbown owned for 28 years and did a great deal of restoration to the home. They recieved a Preservaton award for their efforts. Leo & Meghan Lamontagne are the current owners as of Sept. 15, 2017. Acreage 0.466 acre - 20,778 sq. ft.